We’re all a bit tipsy from wine. A lot tipsy. This is our welcome home dinner. We’ve finished appetizers, the main course and dessert. Dad, Silvia, Alexa & Dylan have already left and now it’s just Mom, Tom, Bob and I sipping wine and chatting by candlelight. We’re talking about everything from the hellacious move to the drive cross-country, to our time in Iowa and everything we’ve learned along the way. “It’s always bothered me and I’ve never said anything,” Mom says then looks at Bob and waits. For permission, I suppose. “And I’m just going to come out and say it,” she continues. Then pauses again. “Go ahead,” Bob says with a hint of curiosity. “Absolutely. You can say anything to me,” Bob assures her. Bob and I exchange a look. What is she talking about? The sixty dollar lobster? What lobster? Ohhhhhhh. 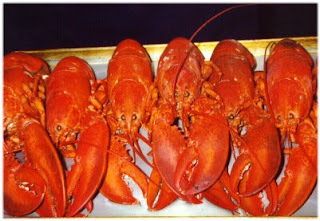 The $60 lobster. Actually, I still only vaguely remember. I remember the restaurant. I remember that it was a celebratory dinner. I remember I had pasta. “It was actually surf & turf. Lobster and steak,” Bob helps. That’s right. Surf & Turf. Now I remember. I remember thinking, yikes, when he ordered it. I agree with Mom. She’s right, $60 is a lot to spend on an entrée. But don’t lots of people spend more than that on a bottle of wine? And Bob was making good money at the time. Working extremely hard. If he wanted Surf & Turf on this special occasion, shouldn’t he be able to order it? I think that’s probably about the justification that went through my mind at that dinner. I look at Bob, worried that this will upset him. But it doesn’t. He hears it. I’m relieved. And impressed. Mom says that it occurred as if he were showing off. Bob says he can understand how she would see it that way but that he was just thinking of it as a very special occasion. The opening night of my play. Me, I understand Mom’s thinking because I am her carbon copy and also always select the least expensive item on the menu. Mom tells Bob that she’s relieved that she could get that off her chest because it’s just always bothered her. “It really bothered her,” Tom adds. “It just really did,” says Mom. That’s when I start laughing. And we all start laughing. At the absurdity of it all. And the relief that we can talk about this without sore feelings. It’s interesting, actually. The biggest spending problem we had, in my mind, is that we were blind. It certainly wasn’t one $60 lobster (sorry, Surf & Turf) that sent us spiraling out of control. It’s that we were blind to ALL of our spending and never prepared for the worst case scenario. If to Mom the lobster was a sign to us it was a symptom. Perhaps focusing on the lobster was easier than digesting, so to speak, the entirety of our spending. We justified our remodel because we truly believed we’d get a return on every penny we put into the house. But we overextended and didn’t plan for the worst. It is a lot to digest. It’s hard enough for us to digest, let alone our parents. The relief, I suppose, is that it’s in the past. And that we are acting responsibly, learning and are open and willing to talk about our errors. Too many could’ve, would’ve & should’ves to count. 3. DON’T borrow until you’re debt free. Just don’t. We haven’t used a credit card in about nine months. Maybe more. We don’t plan on borrowing anything until we’re completely out of debt. We are actually very anti-credit in all regards and are looking at how to live the rest of our lives without it. Perhaps that’s an over-correction and possibly temporary. Credit is fine for those who manage it, pay off the balance every month. But our recent track record doesn’t support that we are those kinds of people. So we’re staying away. Like a new non-smoker… we’re steering clear of the smoking section. 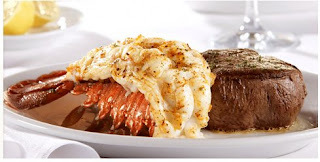 And maybe, just maybe it’s okay to have that $60 Surf & Turf if you budget for it and it’s a special occasion splurge. But wouldn’t it taste so much sweeter if you had it for free? Or at a discount? There are ways. I’m bound and determined to live responsibly and well on less. P.S. Thanks, Mom, for your honesty! And thanks, Bob, for being great! –My Open Wallet – An anonymous New Yorker tells the world how much money she earns, spends, and saves. –Cents to Get Debt-Free – One family’s quest at getting the cents to get free from any and all debt! If you enjoyed this post, will you please do us a favor and share it? Tweet it, Facebook it, Stumble it or good old fashioned e-mail it? Thanks! One distinction that I’ve been taught is a difference between credit and debt. With credit the asset is worth more than the amount owed and therefore you are not held prisoner by it. At any time you can sell the asset and be out from under the amount of the loans. With credit you are in control. Debt is everything else. Debt is bad and credit is usually a good thing when used productively. I loved this post! I’m sure if I really thought about it, I could come up with a lot of $60 lobsters from a few years ago. I also really enjoyed reading the comment by Joe Kelderman above. While I can see the suppossed difference between credit and debt–all in all they are both the same. You are a prisoner to credit every month when you make that payment. It controls you every single month until it is paid off. Joel, your point is extremely valid. You’re right- it’s an important distinction. The issue for us is that we have lots of bad debt. Bad, bad debt. Go-to-your-room-and-never-come-out kind of debt. Kim, thanks for your comment. I’m glad you can relate. And yes, check out those links!